Love the dresdens! How cheery. This is definitely going to a have the Nanette 'look' to it when you're done. congrats on keeping up. I won't talk about your resolution if we don't have to talk about mine either:)Maybe NEXT year will be my 'catch up on UFOs' year! How great that you're keeping up with your projects. That's always an accomplishment. I love your dreden plates - they are lovely, and lie so flat! (mine tend not to) I think everything on this post is lovely eye candy. Nanette, your blocks are adorable as usual...you are the queen of adorable! Nanette ~ I love Jeanna's BOM quilt pattern but decided not to start it as I had too many irons in the fire. Seeing yours makes me want to make one. Yours is my favorite of all that I have seen. If there was a kit made up with all of your gorgeous chioce of fabrics... I would be frist in line to buy it! Simply beautiful! Oh... and I adore the Dresdens in place of the flowers. Wonderful! Seeing those Dresden Plates, makes me think I should really start making some. They look so pretty, Nanette! Lovely matches. Very sweet blocks, Nanette. Love your dresden plates. Your quilt in progress is so pretty. You have used the perfect fabrics for this design. I'm so looking forward to seeing the finished quilt. You've been busy, the blocks are all so pretty, love the Dresdens! I can always count on you for the most cheeriest blocks and you didn't disappoint me. Love the Dresdens. 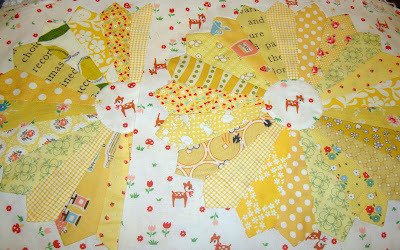 I am lovin' your blocks and your Dresden's are so sweet in their seperate little colorways... adorable! Your quilt looks so fun and happy! I love them! Now I am really wishing I had started on the guild quilt. Oh well. Never too late to catch up I guess. When is the next meeting anyway? Tonight? The dresdens really do it for me, Nanette. I'm lovin those colors! Holy Cow Woman! 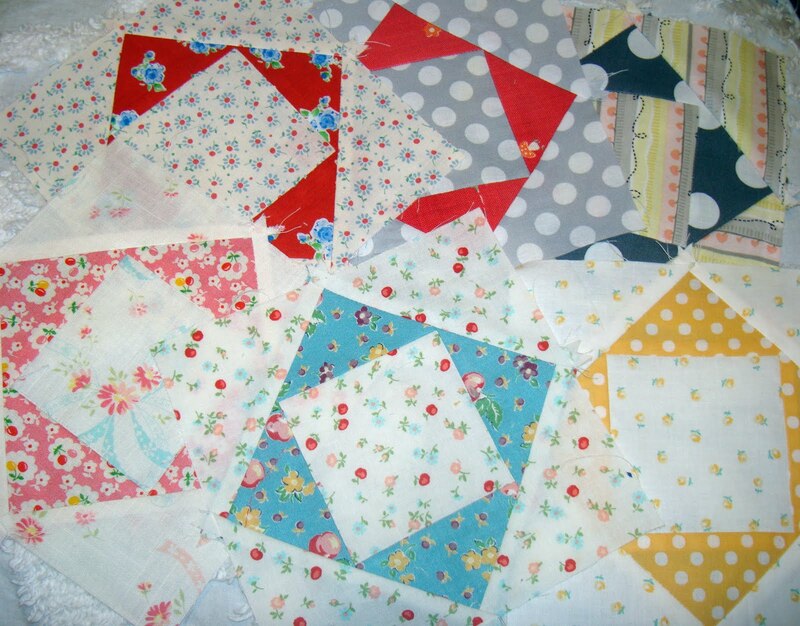 How on earth do you have time to do all that piecing??? 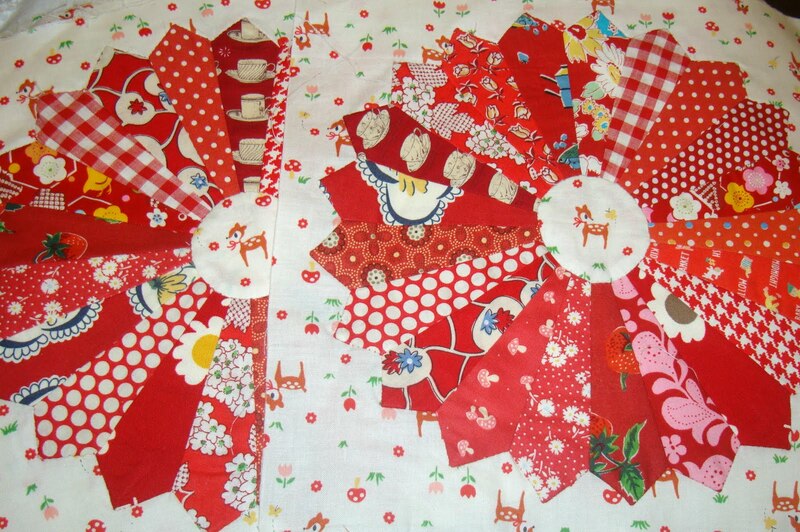 nanette, I think I am going to like this quilt alot. Your choice of fabric is really making it. I would give my right arm to have your fabrics!! Especially the Dresden plate blocks!!! I just love all of these blocks...what a great quilt this is going to be...can't wait to see your new pattern too! Love those dresdens! And I think your version of the quilt is a BIG hit! I love all of your blocks, especially the Dresdens. You have the best stash ever! Seriously! I am in heaven that I have a tiny bit of it to make the mixed bag. :) I am loving your dresdens and I'm so tempted to make some right away. 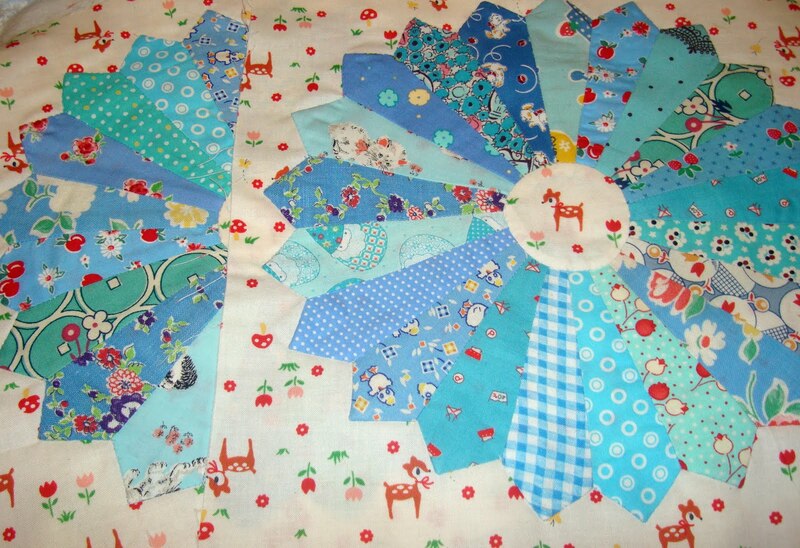 This quilt looks just adorable and of course I was thinking about making it. 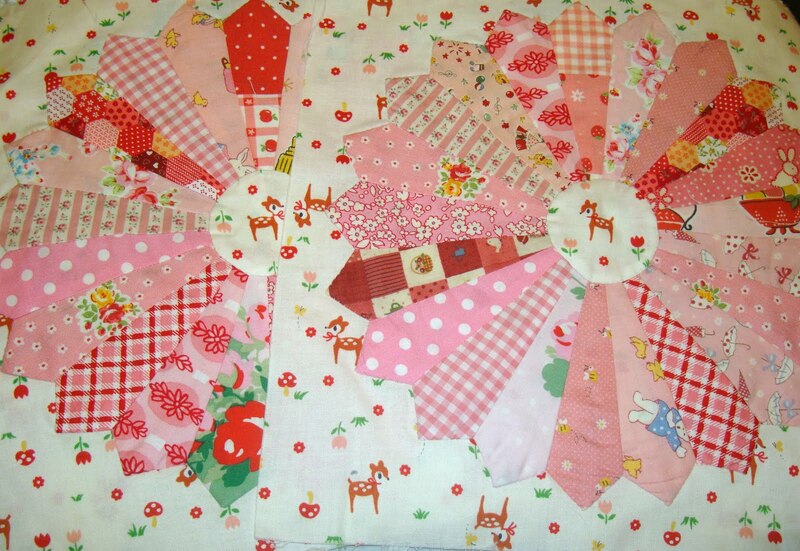 I have looked on the website, but couldn't find the amount of fabric needed to make the entire quilt. Do you have any ideas on that? Let me know if you can. And thanks for your wonderful blog, I really enjoy your adventures. I'm in love with the Dresden's, Nanette! 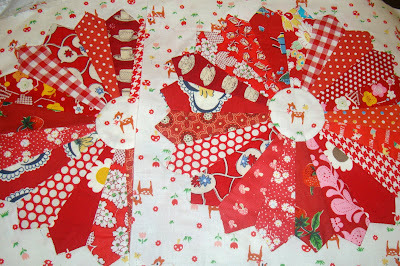 Actually, with all the blocks - this is going to be one very happy quilt! Oh, what a fun quilt you are making. I went to the blog to see the quilt and it is so cute. Yours will be beautiful. Woo Hoo.....love this one...especially the Dresdans!! I too have wanted to try the Dresdans for a l-o-n-g time. I bought a great dvd on them about 2 yrs. ago....LOL....that's about how far behind I am on all the things I want to try. 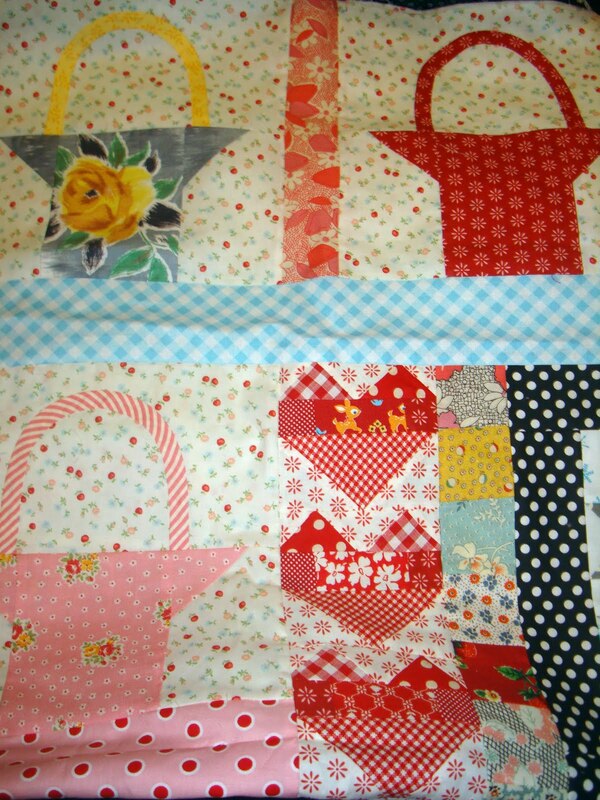 This quilt is scrumptious Nanette! I'm really loving the dresden plates. The background fabric is fabulous with them too. Love your blocks, the Dresden plates are especially neat. I like your fussy cut deer in the center. Your Dresden blocks are soooo gorgeous. I love your bright choice of color. It reminds me of a quilt I inherited from my grandmother. Just beautiful. Those stars are fabulous!!!! 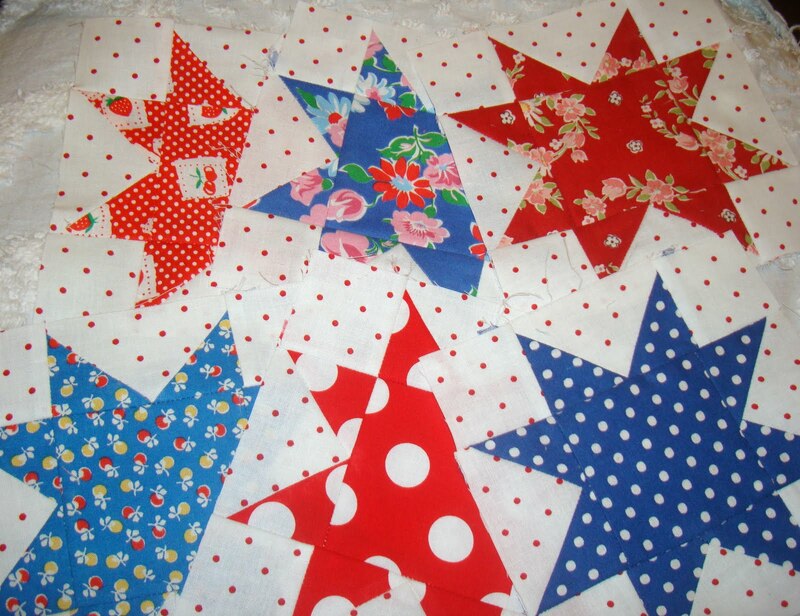 What star pattern did you use? Is there a tutorial?